I am a book lover; as a result this post was long due. These are the books I very highly recommend for every mom-to-be and mom of babies, toddlers and preschoolers. Agree that parenting doesn’t have a manual. But these books come very close to serve that purpose. This book was my pregnancy encyclopedia. It was on my bedside table for a good one to one and half years. 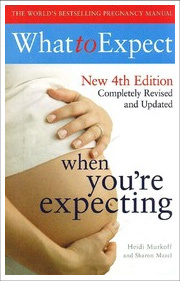 This book is very informative with tips and tricks to address every pregnancy worry. 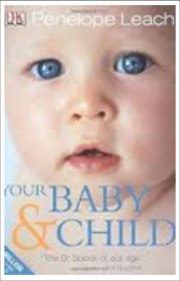 The book is organized by pregnancy month and discusses baby development, common issues and concerns of that month. It is a great reference book with pros and cons for every solution. This book covers issues about pre-pregnancy, pregnancy diet, pregnancy problems and labour. It even has a chapter for expecting fathers. Throw in a couple of chapters on baby’s first few months and the book is irresistible. For me sleep is very important. The only thing that I feared about parenting is sleep deprivation. It is for another day that no book could ever prepare me for sleep deprivation or more aptly, sleeplessness. 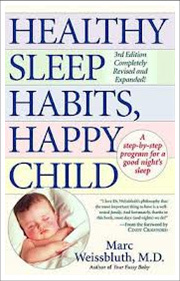 Anyways, I read a lot about how to cultivate good sleeping habits in babies. I read several books on this topic and adopted many theories. I didn’t rock my baby to sleep, I didn’t feed her to sleep, I helped her differentiate day from night and most importantly I didn’t wake her up for feed in the night, instead, I let her wake me up. By 4-5 months, my daughter was sleeping for 6 hours http://humanrightsfilmnetwork.org/clomid straight. That time for myself (sleep and for other things) was luxury! I remember two good books I read about sleeping habits. This book addresses all the common problems of kids in the age bracket of zero to five years. The book focuses on problems from a child’s point of view, helping you to understand and respect your child. She explains why a kid is behaving the way she is and what could be done to address it. It teaches you to follow your child’s lead instead of expecting her to fall in one of the expected brackets. I highly recommend this book for first time parents. My husband and I, as parents, believe in positive discipline techniques. Positive discipline is about non-authoritarian parenting techniques – no spanking or threatening. I have read many books on positive discipline techniques experimenting and adopting various techniques based on what works for my family. 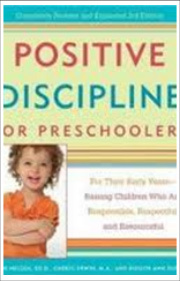 The most popular book on this subject is Positive Discipline series by Jane Nelsen. If you are a new mom and want to know about positive parenting, this is the book for you.